Chainmail is one of the oldest and most prolific armors seen during history. It saw widespread use throughout not only medieval Europe but in dozens of other cultures. It even sees limited use in the modern world! Dark Knight Armoury is all too happy to provide you with the opportunity to pick up a number of fantastic pieces of chainmail armor. Each piece of our chainmail armor is ready made for your convenience. There is no assembling whatsoever. 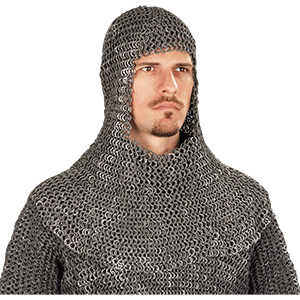 We offer a number of different pieces of chainmail armor, including things like chainmail shirts, coifs, hauberks, and gauntlets. Widening our variety of chainmail armor, we also offer numerous pieces in three distinct styles of chainmail, including butted, flattened, and riveted. Each of these three styles primarily determines how the rings that make up the chainmail are linked. We also offer chainmail armor in different materials, ranging from mild steel to high tensile steel, to even blackened steel and aluminum, ensuring that we have the broadest variety of readymade chainmail armor to offer to you. If you are aiming for an authentic look, our chainmail armor looks great by itself or paired with leather or steel armor. The lighter weight chainmail armor are also fantastic costume pieces. Chainmail is a great addition to any warrior arsenal. Knights, warriors, swordsmen, and mercenaries of all types will enjoy Dark Knight Armourys chainmail armor for its great historical look, as well as the protection and style they offer. Good mail does not only protect the chest or head - it can also protect the arms and legs! 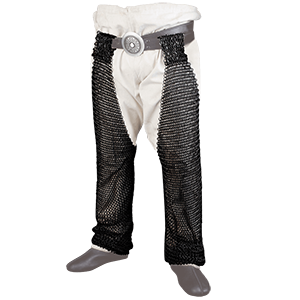 Here at Dark Knight Armoury, we offer a wide selection of chain mail voiders and chausses, which are also known as chain mail sleeves and leggings, all to keep your arms and legs safe whenever you take up a contact event like sword fighting and reenactment. Our selection of chain mail chausses and voiders ranges in type and style, allowing you to armour yourself in a fashion best suited to your need. If you want mail for the look but still want to be light and mobile, we have aluminum voiders and chausses that are perfect for giving the look. More heavy gauge steel chausses and sleeves are perfect for more traditional reenactment, and we offer them in various finishes, from polished zinc plated steel to mild steel, down even to blackened steel! For the reenactor who needs strength without the weight of steel, we can also provide titanium mail! Next time you head into battle, in mail, leather, or plate, make sure you pay a visit to Dark Knight Armoury to fill in the gaps in your defense with some great chain mail sleeves and chain mail chausses. A chain mail coif is a traditional type of head covering that when, worn, protects the almost all angles of the head, as well as the neck and the shoulders. Only the face is left uncovered. Obviously, the head is an important part of the anatomy, which is why Dark Knight Armoury offers such a variety of chain mail coifs. Anything but simple armor, we offer a number of coifs, all of which feature different options which ensure that we have the head protection that will adequately defend your cranium. Like almost all of our chain mail armor, our coifs are available in multiple linkage types, including butted, riveted, and flattened. They are also available in several different types of materials. Ranging from steel to aluminum, the material your coif is made from will help determine how functional it truly is. A chain mail coif can be worn alone, or it can be combined with a helmet to provide a double dose of protection. If you are a knight, fighter, or warrior who understands that to lose your head is to lose the battle - literally, in this case - then do not ride into battle with the protection of one of our chain mail coifs. The hands make for an excellent target during battle. A stronger opponent can be laid low and defeated if their foe can take away their ability to fight. What better way to do just that than to attack the hands and remove their ability to wield a weapon entirely? Chain mail gauntlets are a great preventative measure against this happening to you. A good chain mail gauntlet is not foolproof, but it does offer adequate protection and keeps your hands quite safe from both intentional strikes at your hands and from accidental slips that might happen while wielding a sword or other weapon. 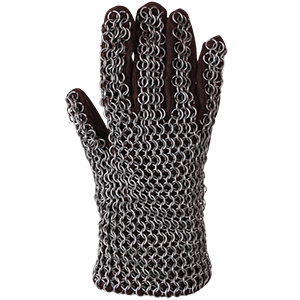 Many of Dark Knight Armourys chain mail gauntlets consist of a leather or suede glove or mitten to which steel chain mail has been affixed to the back. This added layer of protective mail does wonders for keeping hands safe. Not only that, but our chain mail gauntlets are also a great accessory to add to any knightly look. They complement both fantasy based and historical appearances quite nicely. Historically, chain mail has been around for over 2,000 years. It was, and still is, a very effective form of armor that protects a body against harm in a variety of different circumstances. And for the modern day warrior seeking a historically accurate look, nothing looks better then one of Dark Knight Armourys fine chain mail hauberks, or chain mail shirts. A chain mail hauberk, or any type of chain mail for that matter, typically consists of several metallic rings that are carefully linked together to create a mesh of armor that is stronger than its individual parts. Old or new, the concept behind chain mail has remained the same for centuries. And our own chain mail hauberks have not deviated from this pattern. The only thing that differs is, perhaps, the method of manufacture. 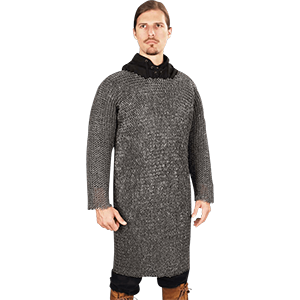 These chain mail hauberks are available in dozens of different combinations to ensure that every warrior can have the chain mail shirt that suits their needs. Short sleeved, long sleeved, sleeveless, butted, riveted, flattened, rounded are only a few of the options available. Additionally, our chain mail is made from various materials, including steel and aluminum. Different materials behave differently, though, so consider your use before you pick your material. chain mail happens to look great when paired with other types of armor, serving to compliment leather or plate armor quite nicely, and a chain mail hauberk makes for a fantastic stand-alone armor as well. Steel chain mail works wonders for realism and reenactments, and aluminum chain mail is fantastic for a realistic look without an armored weight. Either way, a chain mail hauberk almost always compliments a warrior appearance.